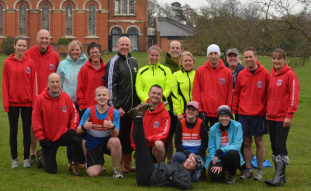 Hedge End Running Club is a friendly running club for the Hedge End, West End and Botley areas of Southampton. The club was formed in November 2012 and now has over 300 members. We are a friendly bunch from serious road athletes to beginners and we currently have space for new members. You can find out more about our training sessions here and membership details here. The best way to find out if you want to join us is to come along to a convenient club run. You don't have to join the club to come running with us for the first time: why not come along and see if you like it?